News that the Gran Fondo is to be held in Northern Ireland for the next three years was announced at the Titanic Building in Belfast. A mass participation cycling event for amateurs and professionals will be held in Northern Ireland for the next three years as a legacy to the Giro d'Italia. The Gran Fondo is run by RCS, the organisers of the Giro, with the first event scheduled for June 2015. Two race routes have been provisionally recommended by the organisers, preceded by cycling activities on the day before the main event across Northern Ireland. Both routes, made up of 177km and 59km, start and finish at Titanic Belfast. Up to 4,000 riders are expected to take part in the one-day major spin-off from the Giro, which attracts amateur competitors from across the world, plus professional former stage winners. Tourism chiefs have invested approximately £400,000 in a bid to capitalise on the feel-good factor generated across the country in May amd while the routes are yet to be announced, they are expected to include the Mourne Mountains and Strangford Lough. 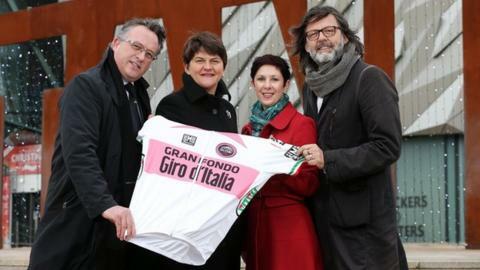 "The 2014 Giro d'Italia captured the imagination of the people of Northern Ireland and was hailed as a resounding success by the organisers, who were bowled over by the warmth of our welcome and enthusiasm," said Arlene Foster, minister of enterprise, trade and investment. Thousands of spectators lined the streets of Belfast to watch the opening stage of the Giro d'Italia in May. "Cyclists are now coming to ride the Giro stages and other routes across Northern Ireland and we want to capitalise on that interest. "The Gran Fondo will establish a tangible legacy event to the Giro d'Italia and further increase awareness of Northern Ireland as a premium cycling and tourism destination, as well as having a positive economic impact." The event attracts amateur cyclists from across the world to the host country to participate. "Following the great success of the 2014 Giro d'Italia Big Start from Belfast, in the amazing scenery of the Northern Ireland coastline, we are very happy to announce a new three-year partnership which will see a series of Gran Fondo Giro d'Italia events hosted in this fantastic country," said Andrea Trabuio, head of mass events, RCS. "We are sure that this 'made in Italy' event will be a big success and will positively promote Northern Ireland." "There will be strong engagement with the local communities, the event will pass through and our aim will be to create the 'pink magic' that was done so well in May during the Big Start," added Darach McQuaid, part of the organising team. Fondo events take place throughout Europe and the rest of the world, with recent hosts including Miami and New York City. Why do cycling's Grand Tours start in other countries? Read more on Giro 2014: Why do cycling's Grand Tours start in other countries?